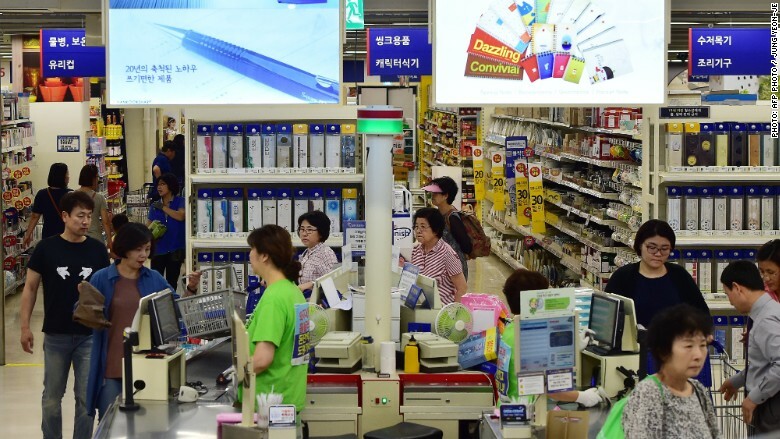 Struggling retailer Tesco is selling its South Korean business in the largest private equity deal the country has seen. Asian buyout firm MBK Partners is leading the $6.1 billion deal to acquire discount retailer Homeplus from the British supermarket chain. The sale will help Tesco (TSCDY) reduce its debt, which totaled nearly $13 billion at the end of February. "This sale... allows us to make significant progress on our strategic priority of protecting and strengthening our balance sheet," said Tesco CEO Dave Lewis. Tesco has been hit hard in recent year by fierce competition from cheaper stores. It reported an annual loss of $8.5 billion in April, one of the biggest losses in U.K. corporate history, after being stung by a sharp fall in the value of its real estate. The disastrous result followed an accounting scandal last year when Tesco admitted overstating its profit forecasts. South Korea was Tesco's biggest business outside the U.K.
Homeplus is South Korea's second biggest retailer with more than 900 stores. It is the only large foreign-operated supermarket chain in the country. The deal, which still needs to be approved by regulators, should be finalized by the end of the year, Tesco said.